While charcoal-based products are mostly used to treat facial skin, they can also be beneficial for the entire body. “Generally, masks are the best way to apply charcoal, because in this form, it can optimally pull toxins and impurities out of the skin like a magnet,” says Nandoo. 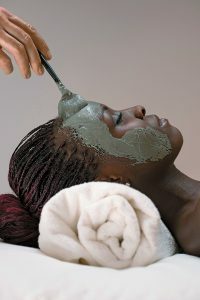 “Activated charcoal is very powerful when used in facial treatments, however, it can also be used as a full-body treatment. As a highly effective detoxifying ingredient, charcoal is known to greatly improve skin health.” At Spa Castle (Carrollton, TX), guests can enjoy the benefits of this ingredient in the Charcoal Tower, which is a room that features activated charcoal to help extract ingested toxins from the body, kill bacteria and viruses, and lower cholesterol levels. To ensure the most effective benefits from charcoal, choose products that contain charcoal that has been activated or dehydrated, as it makes the ingredient more porous, says Stenzel. “Charcoal is a booming ingredient right now and can be incredibly effective when combined properly with other active ingredients,” says Nandoo. In normal amounts, charcoal is not considered to be harmful to the skin, Stenzel agrees that charcoal is safe for all skin types.